Blade Runner 2049: a science-fiction noir flick, and a disaster to try and market. Will the opening weekend box office numbers recover over time? Is Blade Runner 2049 a good movie? Does the sequel retread old ground or does it offer something unique against the original? Does it suffer from sequelitis, a rare and dangerous disease that bloats original concepts into bigger, badder, and often much more shallow and thoughtless characters and plot points? Was Ryan Gosling the right choice? Was bringing Ford back the right choice? Did Denis Villeneuve demonstrate an affinity for the source material’s theme and atmosphere? Was Hans Zimmer successful in offering up a soundscape relevant to the tone of the movie? There are plenty of questions and discussion points for this episode. 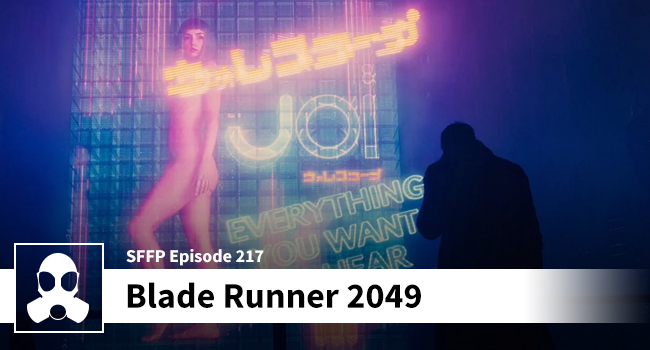 Join Dean, Matthew, and Josh as they wade into the deep waters of the Blade Runner universe. Interlink.